Fight off a pack of wolves. It starts to get dark. The Hungry Pack is the sixth chapter of Legends, and the sixth battle of Act 1. Beasts from the shadows stand in your way. This match starts with both lanes as Shadow lanes. 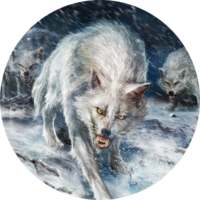 As the Wolves' deck is always in the same order, the use of the unmodified Band of Survivors deck should be sufficient to win. The only threat in the opponent's deck is their turn 4 Alpha Wolf. It only has 1 health, so keep a card ready to deal with it when it comes into play. 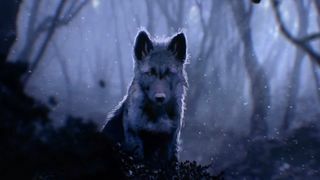 If you choose to adopt the wolf pup at the end of the match, you receive the Snow Wolf card; if you choose to abandon the pup, you get the Cast Out card instead. Like all story choices going forward, it remains possible to later obtain or summon the card you didn't pick. Kellen: "They chose to avoid the roads. 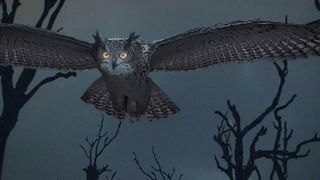 But of course, the wilderness has its own dangers." 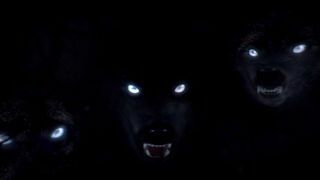 "The cover of the night conceals the wolves. You can't attack them until they show themselves." 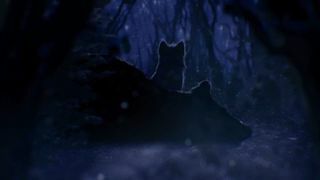 Tyr: "Keep your guard up, or these wolves will tear us apart from the shadows." Kellen: "Once they dispatched the beasts, they heard a whimpering sound. Under a nearby bush lay a cowering wolf pup." Isha: "Did they take it in?" Kellen: "Yes. They believed it would grow into a strong companion." Kellen: "No. They had seen how dangerous these wolves could be." Kellen: They heard a whimpering sound. Isha: Did they take it in? The Wolves draw their cards in a particular order, listed below. Due to differences in what the player does, they may use their cards in a different order, but this list highlights what they can have on any given turn. Pack Wolf Creature (Wolf) 3 2 2 1 Common Summon: Summon a 1/1 Young Wolf in the other lane. Alpha Wolf Creature (Wolf) 4 3 1 3 Epic Other friendly Wolves have +2/+0. This page was last modified on 10 April 2019, at 09:54.